Manually entering contact information into a database is a tedious and distracting task to busy sales professionals. Focused on that month's target and existing deals in the pipeline, crucial contact information is often entered inaccurately or not entered at all. That partial or missing contact could have contributed to a future sale or marketing effort - but, as is, the potential is wasted. ListGrabber™ is a sales management software that incorporates patented contact capture technology to eliminate manual data entry -- including line-by-line cut and paste. Just highlight the contact or a list of contacts and ListGrabber™ will, with a single click, import the selected contacts into your database. Now you can spend more time with prospects and thereby improve your sales conversion ratio. ListGrabber™ further saves time by eliminating duplicates before transferring to the database. It can detect if a contact, being transferred, already exists in your database. 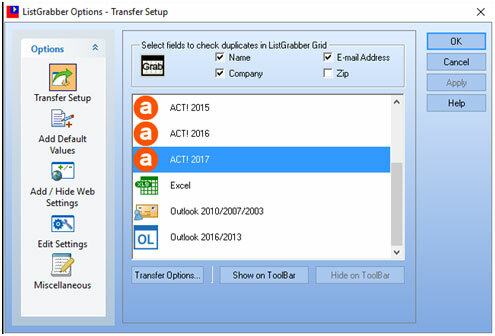 While transferring new contacts to your database, ListGrabber™ Standard can detect duplicate records in the contact manager based on the matching criteria selected. In order to automate the process of detecting and updating an existing record, the transfer can be set up in such a way that you will receive a warning if a contact exists already.